As part of Blogtober, I'll be re-running some past posts that fit this month's theme. This post was originally published in October 2013. It's no secret that I'm pretty into Halloween, and as with most holidays, I like to show that appreciation on my nails. 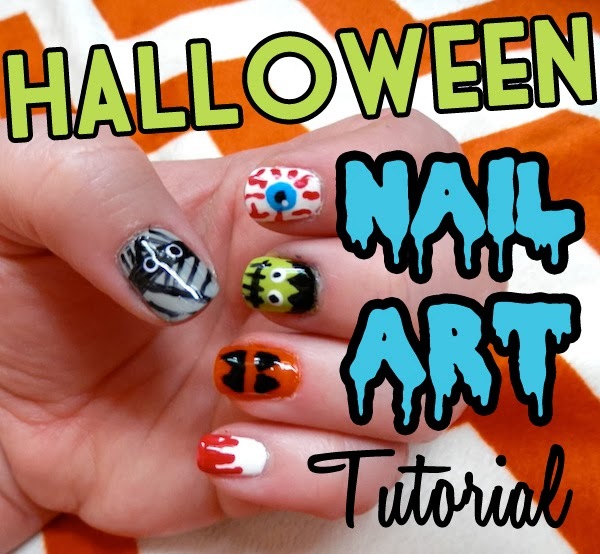 The colors and themes of Halloween are just so much more fun than other holidays (sorry trees and eggs) and they really lend themselves to nail art. 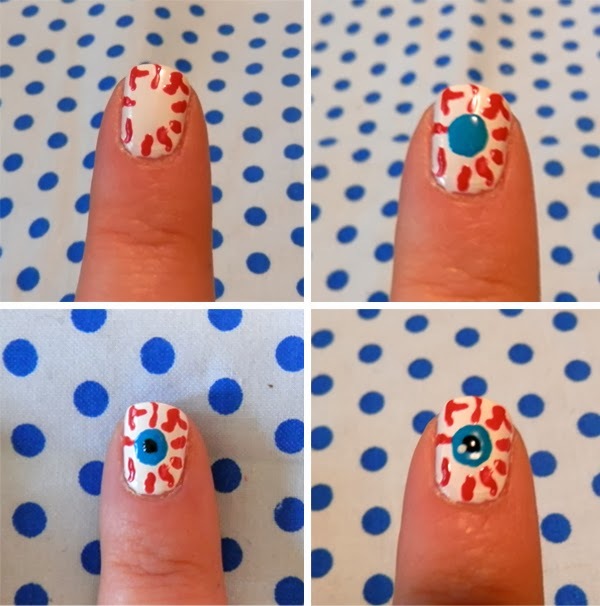 I was planning an eyeball manicure this year, but today I had second thoughts and was struck by indecision, resulting in a different design on every digit. Paint a colored base for each nail. 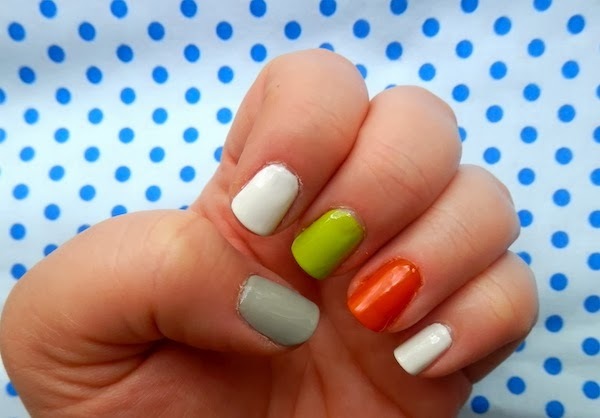 I applied white polish on my pinky and index finger, orange on my ring finger, green on my middle finger and gray on my thumb. For the blood spatter design, first paint a red stripe at the tip of the nail. Using a nail art brush or small dotting tool, draw drips of red polish from the stripe toward the middle of the nail. Messy is fine here! For the jack o'lantern design, use a Sharpie to draw the eyes and mouth. My orange polish reacted weirdly with the Sharpie for some reason, so I topped mine with black nail polish. Usually drawing with a Sharpie works wonders and is SO much easier than nail polish, but it can be unpredictable. 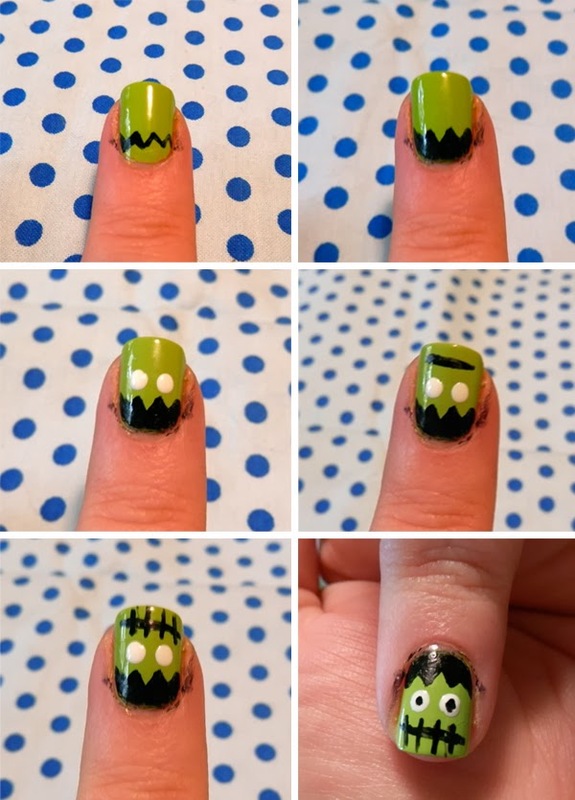 For Frankenstein, draw a zig zag line near the base of your nail [a] and fill in the empty space [b]. Next, use a dotting tool to make two white dots slightly above the zig zag [c]. Draw a black line above the dots with polish or a Sharpie [d] and add short perpendicular lines over it to look like stitches [e]. Add small black dots over the white dots to complete the eyes [f]. For the bloodshot eyeball, use a nail art brush or small dotting tool to draw squiggly red lines around the borders of your nail [a]. Next, draw a blue circle in the center of your nail with a dotting tool [b] and top it with a smaller black circle for a pupil [c]. Optionally, you can add a tiny white dot over the black and blue area as a highlight [d]. 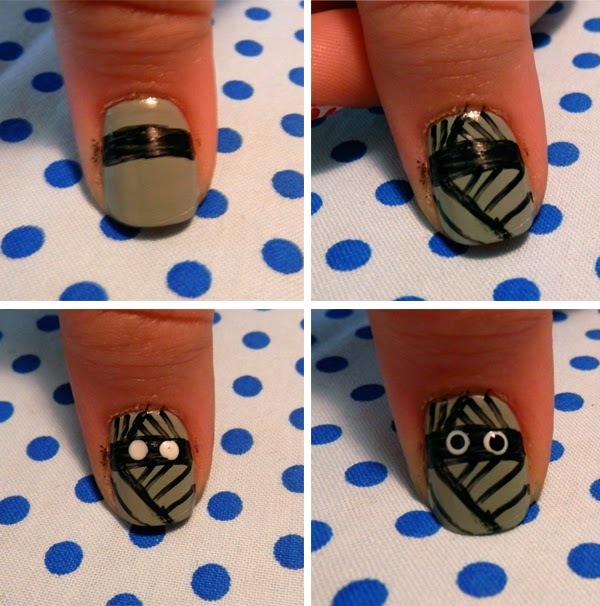 For the mummy, draw a thick-ish black stripe about a quarter of the way down your nail with polish or a Sharpie [a]. Use a thin brush or Sharpie to add random diagonal lines for the wrapping [b]. Use a dotting tool to make two white dots in the center of the black stripe [c] and top them with smaller black dots to finish [d]. Finish everything with top coat and ta-da! Your motley crew of Halloween nail art characters is complete.